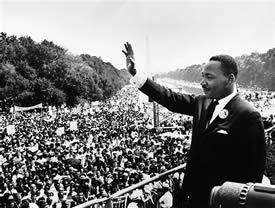 On this day in 1963, Martin Luther King, Jr. gave his famous I have a Dream speech. You may not know this, but the part of his speech where he launched into beginning his sentences with “I have a dream” was not planned. He had used those phrases in the past, but they were not written into this speech. He was inspired by the crowd and went with it. And boy did he go with it. And it has been classified as the #1 speech of the 20th Century. For good reason. His use of repetition was so effective that the speech is remembered for, and titled by, those passages and that phrase. He actually utilized a variety of fantastic rhetorical devices throughout his speech, including alliteration and other forms of repetition. If you’d like to hear it, or read it, you can find MLK’s I Have a Dream Speech here at AmericanRhetoric.com. I always reference this speech when I teach my Presentation Skills for Attorneys seminars. Once, after one of my programs, an attendee came up to me and told me about a book his son had written discussing the speech. It is a terrific book and I recommend it – a very interesting historical look at the speech! The book is called “the Dream: Martin Luther King, Jr. and the Speech that Inspired a Nation.” You can find it on Amazon (of course) and I am sure it’s in bookstores as well. The speech is one of my favorites of all time. Every single person in all of my presentation skills courses (thousands at this point) have heard the phrase and know what it means – we always hear it on the radio, we probably read about it back in school. But when is the last time you listened to the whole thing, or read it the whole thing, if ever? Take the time to do it now. It’s worth it. Jay Rosen is our Latest Featured Speaker!